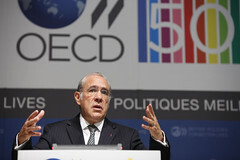 31/10/2011 - Bold decisions are needed from the G20 leaders meeting in Cannes this week to get the global economy back on track, said OECD Secretary-General Angel Gurría. An important first step has already been taken with the debt and banking crisis rescue plan announced by EU leaders on October 26 2011, but these measures must be implemented “promptly and forcefully”, he added. Presenting a special Briefing Note ahead of the Cannes Summit, Mr Gurría said without decisive action the outlook is gloomy. The OECD projects GDP growth to remain weak in the advanced G20 economies over the next two years while the pace of activity in the major emerging markets is likely to be lower than in the pre-crisis period. Uncertainties regarding the short-term economic outlook have risen dramatically in recent months. A number of events, notably related to the euro area debt crisis and fiscal policy in the United States, are likely to dominate economic developments in the coming two years. In an “events-free” scenario and in the absence of comprehensive policy action to resolve current problems, real GDP is projected to grow by about 3.9% this year, 3.8% in 2012 and 4.6% in 2013 on average in G20 countries.1 This average masks a wide divergence among country groupings, and emerging-market economies are much more buoyant, despite some softening. In the euro area, a marked slowdown with patches of mild negative growth is likely. Growth is also projected to remain weak in the United States, with a gradual pick-up from 2012 towards the end of the projection period. Unemployment is set to remain high in many advanced countries. A better upside scenario can materialise if the policy measures that were announced at the Euro Summit of 26 October are implemented promptly and forcefully. These measures go in the right direction and could help restore confidence and create positive feed-back effects that could trigger a scenario of stronger growth. In contrast, the outlook would be gloomier if the commitments made by EU Leaders fail to restore confidence and a disorderly sovereign debt situation were to occur in the euro area with contagion to other countries, and/or if fiscal policy turned out to be excessively tight in the United States. OECD analysis suggests that a deterioration of financial conditions of the magnitude observed during the global crisis (between the latter half of 2007 and the first quarter of 2009) could lead to a drop in the level of GDP in some of the major OECD economies of up to 5% by the first half of 2013. To resolve the euro area crisis, it is important to clarify and implement fully and decisively the measures announced on 26 October to break the link between sovereign debt and banking distress, to deal with Greece, to ensure that the sovereign debt crisis does not spread to other European countries and to secure appropriate capitalisation and funding for banks. Detailed information is needed on how the package will be implemented. In the advanced G20 economies, interest rates should remain on hold or, where possible, be reduced; notably in the euro area. Central banks should continue to provide ample liquidity to ease financial market tensions. Further monetary relaxation, including through unconventional measures, would be warranted if downside risks intensify. In the emerging-market economies, the stance of monetary policy should be guided by the outlook for growth and inflation, which remains comparatively high. Strong, credible medium-term frameworks for fiscal consolidation and durable growth are needed to restore confidence in the longer-term sustainability of the public finances and to build budgetary space to deal with short-term economic weakness. Those advanced economies with sounder public finances can provide additional counter-cyclical support. Structural reforms are essential to boost the growth potential of G20 countries, to tackle high unemployment and to rebalance global demand. In view of weak growth in the near term and impaired fiscal positions in most advanced economies, priority should be given to reforms that offer comparatively strong short-term activity gains and facilitate longer-term fiscal consolidation. In Cannes, G20 leaders will discuss an Action Plan with bold commitments for mutually reinforcing macroeconomic policies and structural reforms. In 2008, G20 leaders rose to the challenge with a clear and coherent plan and we avoided a second Great Depression. Today, the adoption and implementation of the Action Plan is just as imperative to restore confidence through decisive actions in specific countries and regions. The projections reported in the Briefing Note are preliminary and will be updated in the OECD Economic Outlook No. 90 to be released on 28 November 2011.